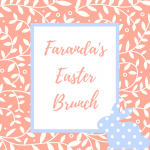 Come Celebrate Easter Brunch with Friends and Family at Faranda’s Banquet Center in Downtown DeKalb. Enjoy Prime Rib, Shrimp Cocktail, Chicken & Waffles, Omelettes Made to Order, Scrambled Eggs, Bacon & Sausage, Mimosa Bar, Bloody Mary Bar and Much Much More at an Egg-stra Special Easter Brunch on Sunday, April 21st, 2019. 10am & 12pm seatings. Adults are $26.99, Children 3-12 are $12.99, Children under 3 eat FREE. (Tax and Gratuity not included.) Reservations required.